There has been no recent reporting on the Skripal case in which a British-Russian double agent and his daughter were poisoned in Salisbury, England. There even seem to be attempts to change the public record of the case. The British government alleged that the Skripals were poisoned by Novichok, a deadly nerve agent, and blamed Russia for it. There are stiill many open questions to ask but the British media, otherwise not afraid of 'door stepping', are curiously uninterested. We already noted in early April that the British press was throwing Novi-Fog™ onto the public. It was repeating outrageous and illogical claims from "security services" but did no genuine reporting on the Skripal case. The D-Notice attempt Thomsen mentioned was too late as some media had already reported the name of the Skripal's MI6 handler. We spelled it out on March 8. One Pablo Miller, a British MI6 agent, had recruited Sergej Skripal. The former MI6 agent in Moscow, Christopher Steele, was also involved in the case. Skripal was caught by the Russian security services and went to jail. Pablo Miller, the MI6 recruiter, was also the handler of Sergej Skripal after he was released by Russia in a spy swap. He reportedly also lives in Salisbury. Both Christopher Steele and Pablo Miller work for Orbis Business Intelligence which created the "Dirty Dossier" about Donald Trump. Did Skripal help Steele to make up the "dossier" about Trump? Were Skripal's old connections used to contact other people in Russia to ask about Trump dirt? Did Skripal threaten to talk about this? If there is a connection between the dossier and Skripal, which seems very likely to me, then there are a number of people and organizations with potential motives to kill him. Lots of shady folks and officials on both sides of the Atlantic were involved in creating and running the anti-Trump/anti-Russia campaign. There are several investigations and some very dirty laundry might one day come to light. Removing Skripal while putting the blame on Russia looks like a convenient way to get rid of a potential witness. If [Sergej Skripal] was also involved in the ‘golden showers’ dossier then elements in the US would have a reason to act as well. The whole incident was an inside job not to kill him, hence the use of BZ, but to give him a warning and a punishment. The whole thing is being treated as though the authorities know exactly what went on but have to cover it up. 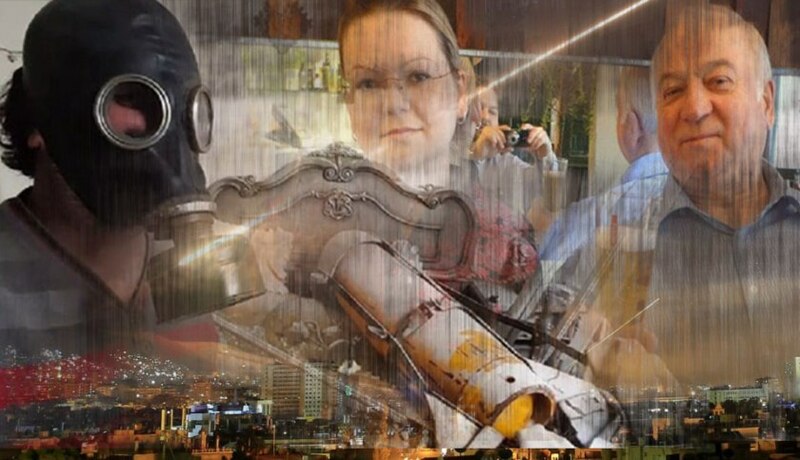 There is not only a very curious silence in British media about the Skripal case, but there seem to be active attempts to remove certain material about the case from the public. Salisbury District Hospital declared a “major incident” on Monday 5 March, after two patients were exposed to an opioid. It followed an incident hours earlier in which a man and a woman were exposed to the drug Fentanyl in the city centre. The opioid is 10,000 times stronger than heroin. I personally read the CSJ story after Gaytandzhiev's first tweeted it on the 26th. I can confirm that it was changed. Salisbury District Hospital declared a “major incident” on Monday 5 March, after two patients were exposed to what is believed to be an opioid. It followed an incident hours earlier in which a man and a woman were exposed to a substance in the city centre. All reference to Fentanyl as cause of the Skripal illness in a March 5 article has been removed between April 26 and April 27. One wonders why such a tiny magazine would bother to change an old story after some journalist tweeted about it. Police declared a major incident after a man in his 60s and a woman in her 30s were found unconscious on a bench in the shopping centre on Sunday. Emergency services at the scene suspected the substance may have been a powerful drug called fentanyl, but nothing has yet been confirmed. They were taken to Salisbury District Hospital where they are in a critical condition in intensive care. In November 2017 the Salisbury Journal had reported about an unrelated fenatanyl overdose case. In 2016 Salisbury had a spike in Fentanyl OD cases. The local emergency services were surely aware of the symptoms and effects of such a substance. It is understood that police suspect fentanyl, a synthetic opiate many times stronger than heroin, may have been involved. A man and a woman are in a critical condition and up to 10 other people are involved. Officers and paramedics were called to The Maltings shopping centre in Salisbury after the man and a woman fell ill. The woman, who was unconscious, was airlifted to Salisbury district hospital at about 4.15pm, while the man was taken by ambulance. It was recently reported that fentanyl has claimed the lives of at least 60 people in the UK over the last eight months. The Devon Live report is still in its original form. It links to the first Wiltshire Police statement on the case and quotes from it. Curiously the link is dead. The first official police statement on the Skripal case is "currently unavailable". The British press is now totally silent on the Skripal case. Craig Murray and another former senior civil servant suspect that the government gave order to not report on the issue. They also suspect, as we did early on, that the case is related to the fake "Dirty Dossier" which the Clinton campaign ordered up to use it against Donald Trump. It is not understandable why the British government would give a silencing order if, as the government alleges, Russia caused the incident. Why is no public investigation by the media allowed? Where is Yulia Skripal and what is the health status of Sergej Skripal? Why have they been silenced?